This icy knight Heartless's skillful defense makes it tough to finish off. Though its focused slash can be stopped with a block, blasting the knight with Firaga while it is storing up energy will stagger it, opening it up to extra damage, especially from magic. This creature not only has lots of HP, but you can also boost its defense! You won't be able to burn it down quickly, so prepare for a long battle! The Chill Ripper is an Emblem Heartless that is found in Kingdom Hearts 358/2 Days. It is one of the bosses at Halloween Town. In a mission to Halloween Town, Roxas is to join Xigbar to eliminate a giant Heartless. As Roxas enters the Graveyard, he meets up with Xigbar, and they continue on to seek out their target. Once the duo reaches the Suspension Bridge, they are attacked by a group of Heartless lead by a Snowy Crystal, which Roxas mistakes as their target. Once the Heartless are defeated, the Chill Ripper slashes its way onto the battlefield, almost crushing Roxas. The two then fight and defeat the Chill Ripper and RTC. 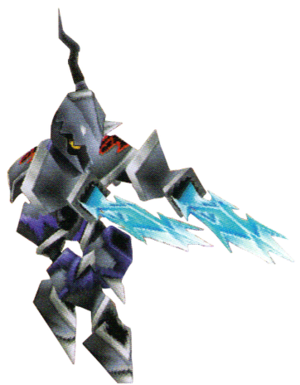 The Chill Ripper is a large, humanoid Heartless covered from head to toe in silver and grey armor, although in Kingdom Hearts χ this armor is cobalt. The armor on its legs sport white spikes and steel blue highlights. Its helmet sports two short, white spikes and a long, twisted, black antenna. A small opening in the front just barely exposes the Chill Ripper's black face and glowing yellow eyes. Its most notable features are the jagged, light blue, ice blades in place of each of its hands. It has two Heartless emblems, one on each of its shoulder pauldrons. The Chill Ripper's name refers to its ice-based attacks and its bladed arms—a "ripper" can refer to a murderer that kills with a blade, or, more literally, it means "one who tears." The Chill Ripper's main two attacks are a lunging spin attack which deals severe ice-based damage, and summoning pillars of ice from the ground; both attacks can be easily avoided by keeping some distance from the Chill Ripper. It also has a charging lunge which can be parried or interrupted with Firaga to stun the Heartless. While stunned, it becomes especially vulnerable to damage. 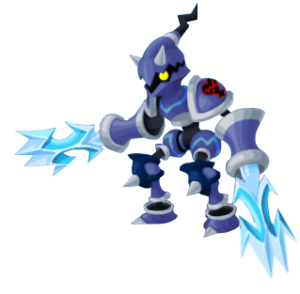 The Chill Ripper is quite agile, and will try to dodge Roxas's attacks by leaping around the battlefield. In Story Mode, Xigbar assists in this battle, but the responsibility for finishing the boss off still falls to Roxas. If available, Roxas can use several Firaga spells to quickly exhaust the Chill Ripper's stamina. Otherwise, focus on avoiding the Chill Ripper's attacks while keeping HP up and using powerful Keyblade combos and Limit Breaks to deal damage. In Mission Mode, it is possible to trigger a glitch in which the player character falls through the ground, which the game engine treats as open air. As such, it is possible for the character to Glide and Air Dash, but eventually they will hit the bottom of the room and immediately expire. This page was last edited on 6 September 2018, at 22:21.